The Boston Community Leadership Academy (BCLA) aims to develop the capacity for leadership in all students, empowering them to make positive contributions to communities. 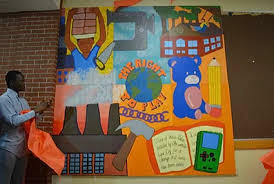 Students worked with teachers, UNICEF representatives, Art and Resistance Through Education (ARTE) and local mural artists to design and create a mural in the school that focused on child slavery. The students placed emphasis on the idea that while all children should have the right to play, not all get that right. Children's toys are mixed together with work tools that symbolise the industries children are often forced to work in, such as a sewing machine, a factory and a hammer.